At the close of the millennium, Crusades were some of the most popular inserts in the hobby. To this day, they remain extremely strong sellers. 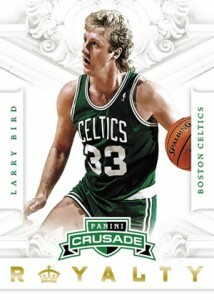 2012-13 Panini Crusade Basketball sees the insert make its official return, this time as its own brand. 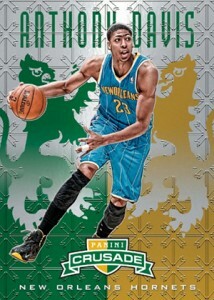 Every pack comes with a hit, a Crusade insert and an additional insert. 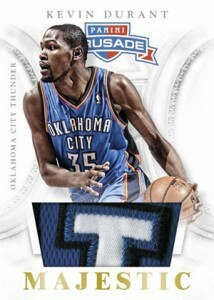 The 2012-13 Panini Crusade base set has a small checklist of 100 cards. Unlike a lot of Panini's other 2012-13 basketball releases, the rookie card crop is small, limited to just 15 players. 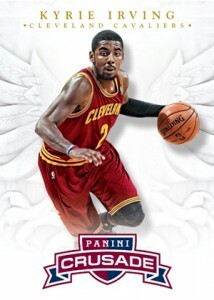 The design has a player photo cast against a moderately stark background that's accented by a light regal insignia. The Crusade logo at the bottom of the card adds a splash of color. Base cards have a Crusade parallel. 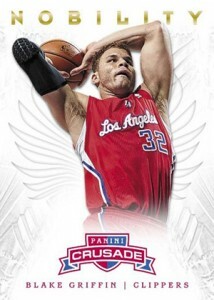 The classic Crusade look returns with Crusade inserts (not to be confused with the brand name or the parallels). The massive checklist has 300 cards printed on chrome-like Prizm card stock. Sticking with tradition, Crusade inserts come in several colors: Red, Purple, Gold Green and Black. Every 2012-13 Panini Crusade Basketball hobby box has three autographs and three game-used memorabilia cards. With six packs in a box, this averages out to a hit per pack. 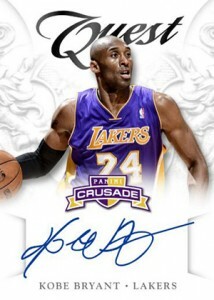 Quest Autographs, Quest Memorabilia, Majestic Signatures and Majestic Memorabilia all have 100 cards each. Nobility and Royalty are both 25-card basic insert sets that come with designs similar to the base set. I pulled the exact same box configuration as the David Henry review above. Same reaction, the sticker autos are a bit disappointing, and base cards have a cheap feel. Honestly, the crusade parallels are the highlight (or the gold Quest jerseys #/25, if I would have been fortunate enough to pull one). Still doesn’t justify the price. Priced like a mid-premium product but really isn’t. A little cheaper than Totally Certified with a nearly identical hit-per-pack, six pack configuration. But Certified is a far superior product, with a better design, lots of serial #’d parallels and on card autos.